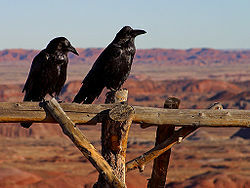 Common ravens in the Petrified Forest National Park, Arizona. Many references to ravens exist in world lore and literature. Most depictions allude to the appearance and behaviour of the wide-ranging common raven (Corvus corax). Because of its black plumage, croaking call and diet of carrion, the raven is often associated with loss and ill omen. Yet its symbolism is complex. As a talking bird, the raven also represents prophecy and insight. Ravens in stories often act as psychopomps, connecting the material world with the world of spirits. French anthropologist Claude Lévi-Strauss proposed a structuralist theory that suggests the raven (like the coyote) obtained mythic status because it was a mediator animal between life and death. As a carrion bird, ravens became associated with the dead and with lost souls. In Swedish folklore, they are the ghosts of murdered people without Christian burials and, in German stories, damned souls. The Raven has appeared in the mythology of many ancient people. Some of the more common stories are from those of Greek, Celtic, Norse, Pacific Northwest, and Roman mythology. Philo of Alexandria (first century AD), who interpreted the Bible allegorically, stated that Noah's raven was a symbol of vice, whereas the dove was a symbol of virtue (Questions and Answers on Genesis 2:38). In the Talmud, the raven is described as having been only one of three beings on Noah's Ark that copulated during the flood and so was punished. The Rabbis believed that the male raven was forced to ejaculate his seed into the female raven's mouth as a means of reproduction. Pirke De-Rabbi Eliezer (chapter 25) explains that the reason the raven Noah released from the ark did not return to him was that the raven was feeding on the corpses of those who drowned in the flood. According to the legend of the fourth-century Iberian Christian martyr Saint Vincent of Saragossa, after St. Vincent was executed, ravens protected his body from being devoured by wild animals, until his followers could recover the body. His body was taken to what is now known as Cape St. Vincent in southern Portugal. A shrine was erected over his grave, which continued to be guarded by flocks of ravens. The Arab geographer Al-Idrisi noted this constant guard by ravens, for which the place was named by him كنيسة الغراب "Kanīsah al-Ghurāb" (Church of the Raven). King Afonso Henriques (1139–1185) had the body of the saint exhumed in 1173 and brought it by ship to Lisbon, still accompanied by the ravens. This transfer of the relics is depicted on the coat of arms of Lisbon. A raven is also said to have protected Saint Benedict of Nursia by taking away a loaf of bread poisoned by jealous monks after he blessed it. In the legends about the German Emperor Frederick Barbarossa, depicting him as sleeping along with his knights in a cave in the Kyffhäuser mountain in Thuringia or the Untersberg in Bavaria, it is told that when the ravens cease to fly around the mountain he will awake and restore Germany to its ancient greatness. According to the story, the Emperor's eyes are half closed in sleep, but now and then he raises his hand and sends a boy out to see if the ravens have stopped flying. An illustration from an 18th-century Icelandic manuscript depicting Huginn and Muninn sitting on the shoulders of Odin. To the Germanic peoples, Odin was often associated with ravens. Examples include depictions of figures often identified as Odin appear flanked with two birds on a 6th-century bracteate and on a 7th-century helmet plate from Vendel, Sweden. 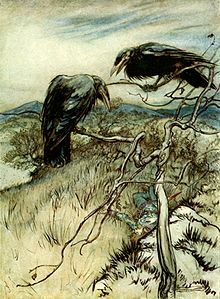 In later Norse mythology, Odin is depicted as having two ravens Huginn and Muninn serving as his eyes and ears – Huginn being referred to as thought and Muninn as memory. Each day the ravens fly out from Hliðskjálf and bring Odin news from Midgard. The Old English word for a raven was hræfn; in Old Norse it was hrafn; the word was frequently used in combinations as a kenning for bloodshed and battle. The raven was a common device used by the Vikings. Ragnar Lothbrok had a raven banner called Reafan, embroidered with the device of a raven. It was said that if this banner fluttered, Lothbrok would carry the day, but if it hung lifeless the battle would be lost. King Harald Hardrada also had a raven banner, called Landeythan (land-waster). The bird also appears in the folklore of the Isle of Man, a former Viking colony, and it is used as a symbol on their coat of arms. In Irish mythology ravens are associated with warfare and the battleground in the figures of Badb and Morrígan. The goddess Morrígan alighted on the hero Cú Chulainn's shoulder in the form of a raven after his death. Ravens were also associated with the Welsh god Bran the Blessed (the brother of Branwen), whose name translates to "raven." According to the Mabinogion, Bran's head was buried in the White Hill of London as a talisman against invasion. He is depicted as giant and the King of the Britons in tale known as the Second Branch of the Mabinogi. Several other characters in Welsh mythology share his name, and ravens figure prominently in the 12th or 13th century text The Dream of Rhonabwy, as the army of King Arthur's knight Owain. According to legend, the Kingdom of England will fall if the ravens of the Tower of London are removed. It had been thought that there have been at least six ravens in residence at the tower for centuries. It was said that Charles II ordered their removal following complaints from John Flamsteed, the Royal Astronomer. However, they were not removed because Charles was then told of the legend. Charles, following the time of the English Civil War, superstition or not, was not prepared to take the chance, and instead had the observatory moved to Greenwich. The earliest known reference to a Tower raven is a picture in the newspaper The Pictorial World in 1883  as well as a poem and illustration published the same year in the children's book London Town. This and scattered subsequent references, both literary and visual, which appear in the late nineteenth to early twentieth century, place them near the monument commemorating those beheaded at the tower, popularly known as the "scaffold." This strongly suggests that the ravens, which are notorious for gathering at gallows, were originally used to dramatize tales of imprisonment and execution at the tower told to tourists by the Yeomen Warders. There is evidence that the original ravens were donated to the tower by the Earls of Dunraven, perhaps because of their association with the Celtic raven-god Bran. However wild ravens, which were once abundant in London and often seen around meat markets (such as nearby Eastcheap) foraging for scraps, could have roosted at the Tower in earlier times. During the Second World War, most of the Tower's ravens perished through shock during bombing raids, leaving only a mated pair named "Mabel" and "Grip." Shortly before the Tower reopened to the public, Mabel flew away, leaving Grip despondent. A couple of weeks later, Grip also flew away, probably in search of his mate. The incident was reported in several newspapers, and some of the stories contained the first references in print to the legend that the British Empire would fall if the ravens left the tower. Since the Empire was dismantled shortly afterward, those who are superstitious might interpret events as a confirmation of the legend. Before the tower reopened to the public on 1 January 1946, care was taken to ensure that a new set of ravens was in place. Ravens appear as stock characters in several traditional Serbian epic poems. Like in many other cultures, the raven is associated with death - more specifically with an aftermath of a bloody or significant battle. Ravens often appear in pairs and play the role of harbingers of tragic news, usually announcing death of a hero or a group of heroes. They tend to appear in combination with female characters as receivers of the news. Usually, a mother or a wife of a hero will be notified about the hero's death by a visit from a pair of ravens. Sometimes, these are treated as supernatural creatures capable of communicating with humans that report about events directly. Alternatively, these are ordinary birds bringing along scavenged body parts, such as a hand or a finger with a ring, by which the fate of the hero will be recognised. Most notable examples of this pattern can be found in songs "Car Lazar i Carica Milica" (Tsar Lazar and Tsarina Militsa) and "Boj na Mišaru" (Battle of Mishar). Goddess Dhumavati riding a crow. In the Story of Bhusunda, a chapter of the Yoga Vasistha, a very old sage in the form of a crow, Bhusunda, recalls a succession of epochs in the earth's history, as described in Hindu cosmology. He survived several destructions, living on a wish-fulfilling tree on Mount Meru. Crows are also considered ancestors in Hinduism and during Śrāddha the practice of offering food or pinda to crows is still in vogue. The Hindu deity Shani is often represented as being mounted on a giant black raven or crow. The crow (sometimes a raven or vulture) is Shani's Vahana. As protector of property, Shani is able to repress the thieving tendencies of these birds. The raven is the national bird of Bhutan, and it adorns the royal hat, representing the deity Gonpo Jarodonchen (Mahakala) with a Raven's head; one of the important guardian deities. A raven in a cemetery. Because they are scavengers, ravens have been associated with death. The raven also has a prominent role in the mythologies of the Indigenous peoples of the Pacific Northwest Coast, including the Tsimishians, Haidas, Heiltsuks, Tlingits, Kwakwaka'wakw, Coast Salish, Koyukons, and Inuit. The raven in these indigenous peoples' mythology is the Creator of the world, but it is also considered a trickster god. For instance, in Tlingit culture, there are two different raven characters which can be identified, although they are not always clearly differentiated. One is the creator raven, responsible for bringing the world into being and who is sometimes considered to be the individual who brought light to the darkness. The other is the childish raven, always selfish, sly, conniving, and hungry. When the Great Spirit created all things he kept them separate and stored in cedar boxes. The Great Spirit gifted these boxes to the animals who existed before humans. When the animals opened the boxes all the things that comprise the world came into being. The boxes held such things as mountains, fire, water, wind and seeds for all the plants. One such box, which was given to Seagull, contained all the light of the world. Seagull coveted his box and refused to open it, clutching it under his wing. All the people asked Raven to persuade Seagull to open it and release the light. Despite begging, demanding, flattering and trying to trick him into opening the box, Seagull still refused. Finally Raven became angry and frustrated, and stuck a thorn in Seagull's foot. Raven pushed the thorn in deeper until the pain caused Seagull to drop the box. Then out of the box came the sun, moon and stars that brought light to the world and allowed the first day to begin. Bill Reid created the sculpture of The Raven and The First Men depicting a scene from a Haida myth that unifies the Raven as both the trickster and the creator. According to this myth, the raven who was both bored and well fed, found and freed some creatures trapped in a clam. These scared and timid beings were the first men of the world, and they were coaxed out of the clam shell by the raven. Soon the raven was bored with these creatures and planned to return them to their shell. Instead, the raven decided to search for the female counterparts of these male beings. The raven found some female humans trapped in a chiton, freed them, and was entertained as the two sexes met and began to interact. The raven, always known as a trickster, was responsible for the pairing of humans and felt very protective of them. With the Raven perceived as the creator, many Haida myths and legends often suggest the raven as a provider to mankind. Another raven story from the Puget Sound region describes the "Raven" as having originally lived in the land of spirits (literally bird land) that existed before the world of humans. One day the Raven became so bored with bird land that he flew away, carrying a stone in his beak. When the Raven became tired of carrying the stone and dropped it, the stone fell into the ocean and expanded until it formed the firmament on which humans now live. “ Long ago, near the beginning of the world, Gray Eagle was the guardian of the Sun, Moon and Stars, of fresh water, and of fire. Gray Eagle hated people so much that he kept these things hidden. People lived in darkness, without fire and without fresh water. Other notable stories tell of the Raven stealing and releasing the sun, and of the Raven tempting the first humans out of a clam shell. Another story of the Kwakiutl or Kwakwaka'wakw of British Columbia who exposed boys' placentas to ravens to encourage future prophetic visions, thereby associating the raven with prophecy, similar to the traditions of Scandinavia. In one legend Raven transformed himself into a pine needle which is swallowed by the unmarried daughter of the owner of the box of daylight, who then becomes pregnant and gives birth to Raven in disguise. 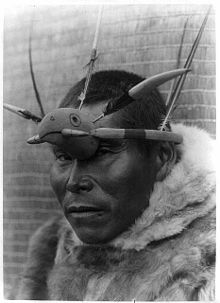 The raven god or spirit Kutcha (or Kutkh, (Кутх)) is important in the shamanic tradition of the Koryaks and other indigenous Chukotko-Kamchatkan peoples of the Russian Far East. Kutcha is traditionally revered in various forms by various peoples and appears in many legends: as a key figure in creation, as a fertile ancestor of mankind, as a mighty shaman and as a trickster. He is a popular subject of the animist stories of the Chukchi people and plays a central role in the mythology of the Koryaks and Itelmens of Kamchatka. Many of the stories regarding Kutkh are similar to those of the Raven among the indigenous peoples of the Pacific Northwest Coast, indicating a long history of indirect cultural contact between Asian and North American peoples. Two ravens or crows, flying over the warrior's head in battle, symbolised in Yakut mythology the Ilbis Kyyha and Ohol Uola, two evil spirits of war and violence. Some other gods or spirits in yakut shamanism, including Uluu Suorun Toyon and Uluutuar Uluu Toyon, are described as "great raven of cloudy sky". The raven is often depicted in the literature of the Western Canon. In Susanna Clarke's novel Jonathan Strange & Mr Norrell (2004), the common title of the long vanished magician king of northern England, John Uskglass, is the Raven King. He often summoned flocks of ravens for dramatic effect during military campaigns, or when he magically appeared somewhere. Throughout the novel, ravens appear as signs of his impending return or particular acts of magic. In Neil Gaiman's novel American Gods, the ravens Huginn and Muginn play an important role. In Charles Dickens' historical novel Barnaby Rudge (serialized in 1841), the raven "Grip" is an important character. A shapeshifting alien appears variously as a Tlingit shaman named Gordon and as a raven (as noted above, significant in Tlingit mythos) in Joe Haldeman's science fiction novel Guardian (2002). In Christopher Marlowe's play The Jew of Malta (written 1589-1590), the raven's darkly ominous image is employed. The raven is used as a supernatural messenger in Edgar Allan Poe's narrative poem "The Raven" (1845). In this and in Dickens' book, the bird's mimicry of speech is important. Branwyn Rhodes' children's book, Legend of the Ravens (2013), illustrated by Mike Kunde, is based on the legends about the Tower of London ravens during the reign of Charles II in the 1600s. William Shakespeare refers to the raven more often than to any other bird; works such as Othello (ca. 1603) and Macbeth (believed to have been written between 1599 and 1606) provide examples. In Edmund Spenser's The Faerie Queene (first installment published in 1590, and a second installment in 1596), the raven's darkly ominous image is employed. In The Hobbit (1937) by J. R. R. Tolkien, Roäc son of Carc is the leader of the Ravens of the Lonely Mountain. In "The Saga of Larten Crepsley" book Ocean of Blood, Mika Ver Leth is described as being what a raven would look like in human form. In the A Song of Ice and Fire series (as well as its television adaption Game of Thrones) by George R. R. Martin, ravens are used as a means of long distance communication, similar to carrier pigeons. In addition, a three-eyed-raven figure makes a prominent appearance. In the well-known ballad "The Three Ravens" (published in 1611), a slain knight is depicted from the point of view of ravens who seek to eat him but are prevented by his loyal hawks, hounds and leman (lover). Raven was a blues/rock band formed in 1967 in Buffalo, New York, and active until 1970. British rock band The Stranglers named their 1979 album after the bird which also appeared on the album artwork and was the title track of the record. British musician Steven Wilson released an album in 2013 entitled "The Raven That Refused to Sing (And Other Stories)" which peaked at #28 on the UK album charts, #57 in the US, and rose to #3 in Germany. The first name "Bram" is derived from a convergence of two separate etymological sources, one being an abbreviation of "Abraham", but the other being the Gaelic word "bran", meaning "raven". The name Bran signifying a raven was used in medieval Ireland. Jimmy the raven appeared in more than 1,000 feature films from the 1930s through the 1950s. In Damien: Omen II (1978), the titular teenage Antichrist has one as his protector. In Disney's The Lone Ranger (2013), the character of Tonto (portrayed by Johnny Depp) throughout the film wears a raven headdress. In Disney's Sleeping Beauty (1959), Maleficent has a loyal pet raven named Diablo. He is Maleficent's most useful minion. Diablo manages to locate Aurora's hiding place in the Cottage in the Woods, along with the Three Fairies. Diablo appears in the film Maleficent (2014), where he is renamed Diaval and is transformed frequently into a human (played by Sam Riley), a dog, a horse, and a dragon as she feels is necessary. He is rescued by Maleficent from a hunter and his dog, when she first shapeshifts him into a human. The act seems to leave him indebted to her and, while frequently sarcastic and disapproving of her actions, he supports and aids her. Edgar Allan Poe's poem "The Raven" has been adapted into films, first in 1915, then in 1935, 1963, and 2012. In Disney's Snow White and the Seven Dwarfs (1937), the Evil Queen [Grimhilde] has a pet raven as her familiar. Grimhilde's raven is completely silent and unnamed; his fate remains uncertain. He is frightened of the Queen in her Witch Form and is only seen when the Queen is in her Laboratory underneath the castle. Today considered controversial, Jim Crow, Fats, Deacon, Dopey, and Specks are crows in the animated Disney film, Dumbo (1941); they speak in stereotypical "jive" of the period. In the 1960s American TV sitcom The Munsters, instead of a "cuckoo" clock at The Munsters' home, within such a clock lives the family's talking pet raven named Charlie, usually only saying "nevermore", but sometimes wisecracking and even flying out of the clock on occasion. In HBO's television series Game of Thrones, as in George R. R. Martin's A Song of Ice and Fire fantasy novel series on which it is based, uses the Raven as a messenger bird. Additionally, the Three-eyed raven appears in Bran Stark's dreams to guide him on a quest. In addition, the members of the Night's Watch are nicknamed "Crows" due to them only wearing black. Raven appears as the trickster god of Native American mythology and one of the children of Oberon in the Gargoyles episode "Heritage." Ravens are common charges in world heraldry and continue to make regular appearances in modern logos and symbolism. The coat of arms of Lisbon recalls the story of St. Vincent's ravens. The common raven is the official bird of the Yukon and of the city of Yellowknife, Northwest Territories. The common raven serves as a city symbol in Baltimore owing to the downtown location of Edgar Allan Poe's gravesite. Poe's most famous poem inspired the name and colours of the Baltimore Ravens, a National Football League team. In Sui Ishida's dark fantasy manga Tokyo Ghoul, a ghoul named Renji Yomo is nicknamed "Raven" (カラス karasu) by humans. Like ravens, Yomo is a scavenger, and he procures suicide victims for consumption for ghouls who are too weak or do not wish to hunt for prey. His kagune (main predatory organ), is in an ukaku configuration, meaning its placement is above the shoulder blades, resembling the wings of a bird. They are also the only kagune revealed in the series to be pitch black, identical to a raven. Lastly, as with all ghouls, Yomo wears a mask to hide his identity. His mask resembles that of a raven's beak, and is colored black. In the On the Fastrack comic strip, the Goth woman, Dethany Dendrobia, has a pet raven named "Lenore" in reference to the Edgar Allan Poe poem. Lenore is a recurring character and appears quite frequently, interacting with Dethany and other characters in the strip. In the Haunted Mansion attraction at Disneyland, a raven makes several appearances. In the fictional Warhammer 40,000 universe, the Raven Guard are an original founding legion of the Space Marines which take inspiration from the Corvidae family such as their beak like helmets, black power armour and the name of their founding Primarch, Corvus Corax. In Darksiders 2, an action-RPG developed by Vigil Games, the player character is guided through the game by a Raven called Dust, which points out objectives. John Gould, Corvus Corax, c.1860's. Ravens on the coat of arms of the Hungarian Hunyadi family. ^ Schwan, Mark (January 1990). "Raven: The Northern Bird of Paradox". Alaska Fish and Game. Archived from the original on 2010-01-02. Retrieved 2007-02-12. ^ Lendering, Jona. "Livy: the Periochae of Books 6-7". www.livius.org. Book 7:10. Retrieved 27 August 2018. ^ See H. B. Tristram, Natural History Bible (9th ed. ; London: Society Promoting Christian Knowledge, 1898), 198. ^ b. Sanhedrin 108b. According to the Icelandic Landnámabók—a story similar to Noah and the Ark -- Hrafna-Flóki Vilgerðarson used ravens to guide his ship from the Faroe Islands to Iceland. ^ This tradition is also preserved in the Byzantine composition Palaea Historica. See David Flusser, "Palaea Historica An Unknown Source of Biblical Legends," Scripta Hieroslymitana 22 (1971): 48-79. ^ "The Death of Cu Chulainn". Celtic Literature Collective. ^ "Branwen daughter of Llŷr". The Four Branches of the Mabinogi. Trans. for example by Patrick K. Ford, The Mabinogi and Other Medieval Welsh Tales (1977). ^ Sax, Boria. City of Ravens: London, Its Tower, and Its Famous Birds. London: Duckworth, 2011, p. 26-27. ^ "The Tower of London". AboutBritain.com. Retrieved 2007-03-03. ...legend has it that, if they leave, the kingdom will fall. ^ Boria Sax, "How Ravens Came to the Tower of London", Society and Animals 15, no. 3 (2007b), pp. 272-274. ^ Felix Leigh, Thomas Crane & Ellen Houghton (1883). London Town. Marcus Ward & Co. pp. 8–9. ^ Boria Sax, "How Ravens Came to the Tower of London", Society and Animals 15, no. 3 (2007b), pp. 270-281. ^ a b Kennedy, Maev (November 15, 2004). "Tower's Raven Mythology May Be a Victorian Flight of Fantasy". The Guardian. p. 1. ^ Sax, Boria (2007). "Medievalism, Paganism, and the Tower Ravens". The Pomegranate: The International Journal of Pagan Studies. 9 (1): 71–73. doi:10.1558/pome.v9i1.62. ^ Sax, Boria (2010). "The Tower Ravens: Invented Tradition, Fakelore, or Modern Myth". Storytelling, Self, and Society. 6 (3): 234. doi:10.1080/15505340.2010.504413. ^ "It's a crow's day". The Hindu. 2001-07-26. Retrieved 14 June 2013. ^ Singer, Eliot A. "Fakelore, Multiculturalism, and the Ethics of Children's Literature". ^ Mann, PhD, Rachel (February 26, 2009). "Meeting the New Shamans". MettaKnowledge for Peace. Rachel Mann, PhD. Archived from the original on 5 March 2013. Retrieved 14 June 2013. ^ Turk, Jon (2010). The Raven's Gift: A Scientist, a Shaman, and Their Remarkable Journey Through the Siberian Wilderness. St. Martin's Press. ISBN 1429964707. Retrieved 14 June 2013. ^ Tolkien, J. R. R. (1985). The Hobbit. Ballantine Books. ISBN 0-345-33207-5. GodChecker.com entry includes story of Raven stealing the sun. This page was last edited on 12 April 2019, at 00:21 (UTC).